High Peaks Pure Earth has translated a blogpost by Woeser written on June 13, 2012 for the Tibetan service of Radio Free Asia and posted on her blog on June 24, 2012. Woeser describes the situation in Lhasa immediately following the self-immolation of two Tibetans there on May 27, 2012. The picture that Woeser describes directly counters CCTV’s “Happiness” survey that declared Lhasa to be the happiest city in China, for the fifth consecutive year. The photos above are from Sina Weibo, taken by tourists; they show the old town of Lhasa. 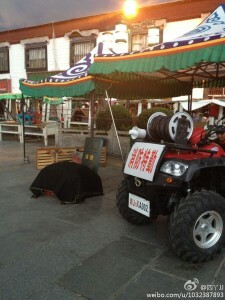 Picture 3 shows a red fire extinguisher covered with a black cloth, it can only vaguely be made out. 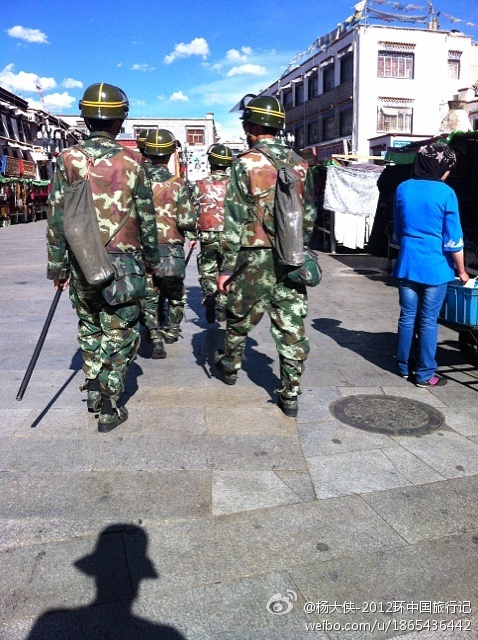 Quite peculiar scenes have been occurring in the old town of Lhasa, all military police patrolling the streets have been carrying fire extinguishers on their backs. 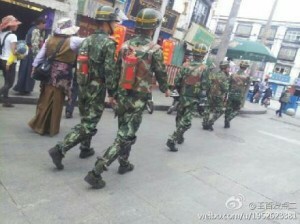 This is related to May 27 when two Tibetans self-immolated between Jokhang Temple and the Police Station in the Barkhor. In fact, already back in 2009 after Tapey, the monk from Ngaba, self-immolated, military police stationed in Tibet were equipped with fire extinguishers. 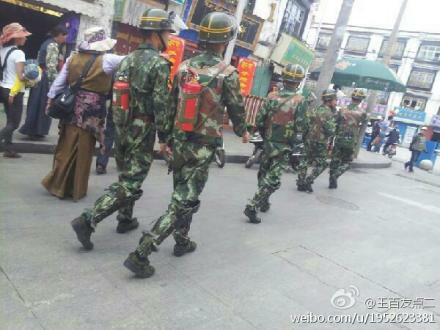 Along with the number of self-immolation cases rising to 39, nowadays, at least two people out of each military police group consisting of five people, carry a fire extinguisher. Doesn’t this show that the authorities are empathetic, preparing fire extinguishers readily available to rescue people? Exactly the opposite is the case, this has, in fact, become the greatest irony. If the truth in the Tibetan region is really as they say, that there is “never seen before happiness”, how is it possible that Tibetans continue to dauntlessly bathe their bodies in flames? Hence, the scene of fire extinguishers flooding into Tibet is not one that the authorities are happy to present to the people. Quite obviously, this scene conveys the following message: on the one hand, they mercilessly start a fire, on the other hand, they assume the pose of extinguishing the fire, to the extent that they appear to start a fire while shouldering a fire extinguisher. From these stories and personal experiences it becomes clear that the aim of the security checks is to see who is Tibetan and who is Chinese. As long as one is Tibetan, life in Lhasa presents itself as quite inconvenient, but as long as one is Chinese, Lhasa turns into a fun theme park. This differentiation between Tibetans and “Han” can also be observed in the relationship with the military police; while Tibetans try everything to avoid them and are full of loathing, Han Chinese regard them as a symbol of security, they have even been invited by police officers to take a ride on the back of a armoured vehicle to get some fresh air. Back in the 1970s, the United Nations Security Council passed a resolution in view of the harsh situation in South Africa, which stated that policies of apartheid are “crimes against the conscience and dignity of mankind.” However, facing the situation in the entire Tibetan region, facing the situation of Tibet’s capital city – Lhasa – hasn’t the world forgotten about the boycotts that it imposed in the past upon countries and governments that implemented and practiced apartheid? The authorities use the methods of racial segregation to check upon and clean up Tibetan people, but can they really put an end to the self-immolations in this way? In fact, the monk, Chime Palden, who self-immolated in Ngaba Prefecture, Barkham County on March 30 this year, had been arrested for over one month when he was on a pilgrimage in Lhasa last year because he had saved a picture of His Holiness, the Dalai Lama, in his mobile phone. Unbelievable policy to differentiate the Tibetan people from it’s own land ,as those who does’n have so called the ‘legal permit’ (the Chinese government imposed to the Tibetans living in the capital city lhasa) can roam freely and exercise in the morning without a little bit of checking by the police. 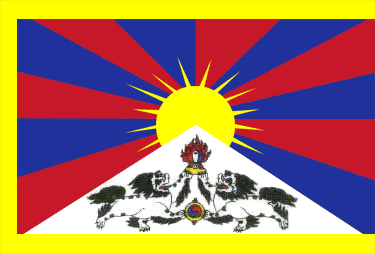 A real kind of Nazism is taking place in Tibet Under the invasion of china. A few years ago as an author I wrote a story in German, “Mein Weg in den Norden über die früh gealterten Himalayas — die Schneeberge” (My way into the North over the early aged Himalayas – the snow mountains). This is a description on my fictitious wandering throuh Tibet in the future, thousand years ahead. This story I wrote in the deep hope that the Tibetan culture and spirituality will survive and help mankind to gain a true humanity – after all atrocities and cultural destructions from the side of Chinese authorities have ended – with a deep regret from the Chinese side. – To be seen here: http://mein-tibet-organisation.blogspot.de/ , from this site you may come to the very story by klicking on the mentioned URLs. And a few informations here: http://tibet-in-freiheit.blogspot.de/ . My story has grown through my western eyes and lacks some personal asian excperiences.